Do you have a favorite easy recipe that never fails? A recipe everyone loves? and one you can whip up on short notice? 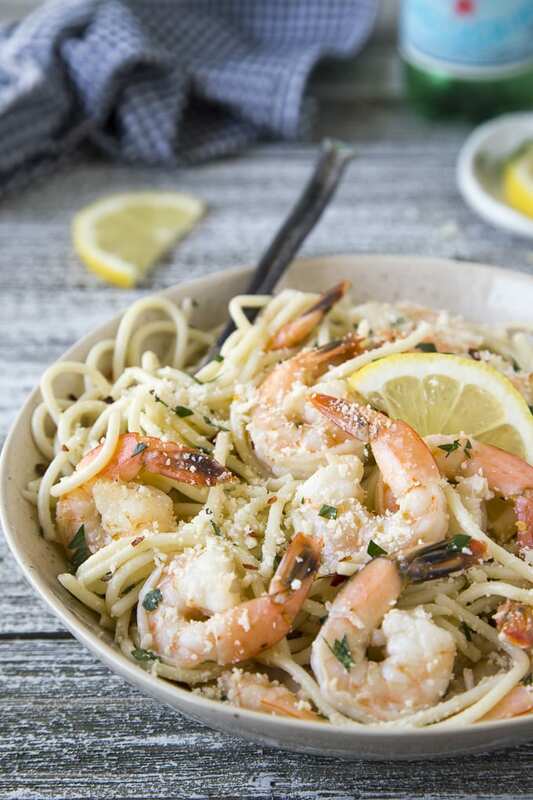 This Easy 15 minute Shrimp Scampi of those recipes! Quick and easy enough to make for a weeknight dinner yet fancy enough to serve when guests come over. Win win! I’m using fresh raw (already peeled and deveined) shrimp for this recipe but you can just as easily use frozen shrimp that has been defrosted. Keeping a bag of frozen shrimp in the freezer and some dry pasta like linguine or spaghetti means you can whip up this easy meal anytime. For this particular recipe it’s very important to have all of your ingredients prepped and ready to go. The shrimp cooks SO fast, you’ll want to have everything measured out and ready to add to the pan quickly. 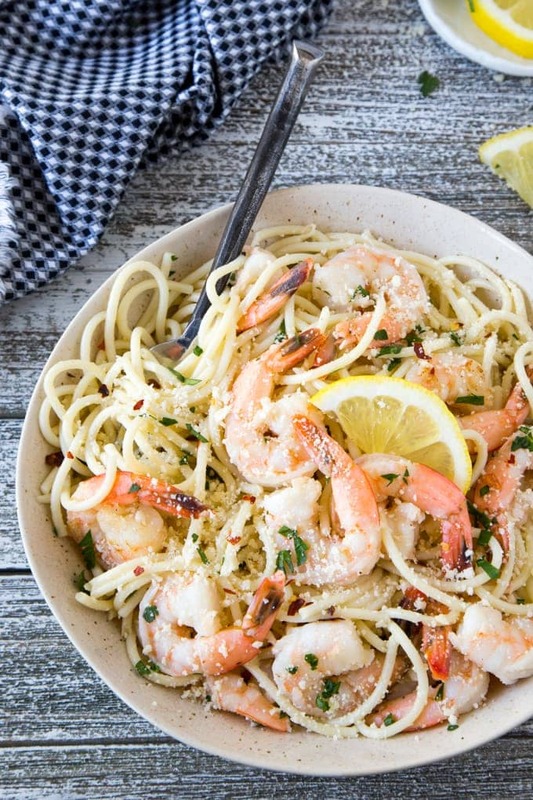 What is the best pasta to use for Shrimp Scampi? 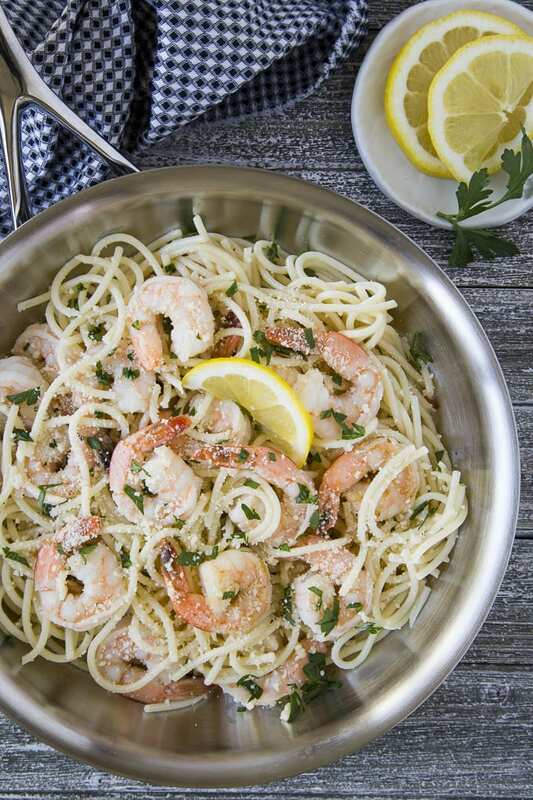 Any type of “strand” pasta like linguine, spaghetti, angel hair or capellini are all good choices for Shrimp Scampi. For this particular recipe I recommend using either linguine or spaghetti as it’s a complementary size pasta for the size of the shrimp (medium to large) and the thickness of the sauce. Angel hair pasta or capellini are thinner varieties of strand pasta and would be a good choice if you elect to use a smaller size shrimp. I’m guessing many people are familiar with using Zoodles (zucchini noodles) as a substitute for pasta to keep things low-carb or gluten-free and this recipe works great with zoodles but I wanted to share a recent discovery with you….Kohlrabi linguine! Have you heard or it? Kohlrabi is a vegetable in the same species as cabbage, broccoli and cauliflower. The taste and texture of kohlrabi is similar to broccoli stems or a cabbage heart but milder and sweeter. On a recent trip to Whole Foods I discovered Mann’s Kohlrabi Linguine and was immediately drawn to just how much the kohlrabi linguine looked like regular linguine! Even the texture seemed comparable so I thought I’d give it a whirl. LOVE! I have a new favorite pasta alternative! Kohlrabi linguine! The taste of the kohlrabi linguine itself is very neutral and absorbs the flavor of whatever sauce you put over it. The texture is much more firm than zoodles and has more of a “toothy” feel, similar to regular pasta. For this recipe I would cook the kohlrabi linguine in the pan first (with a little olive oil) for about 5 minutes until it is starting to turn soft (and pasta like). You could also steam in the bag if you prefer. After the kohlrabi noodles are cooked, remove them from the pan before adding the shrimp, garlic, wine and red pepper flakes etc. After the shrimp has finished cooking add the butter and the cooked kohlrabi linguine and top with grated Parmesan cheese. I’m not affiliated with Manns, I’m just obsessed! with kohlrabi linguine lately and wanted to share with you if you haven’t discovered it yet. Check your local Whole Foods, Safeway or other grocery chains for Manns Kohlrabi Linguinie. I haven’t tried to spiralizer a kohlrabi yet but that’s another option. Should you leave the shrimp tails on when making Shrimp Scampi? The short answer…it’s entirely up to you! There seem to be an equal number of people who like to leave the tail on for visual appeal and presentation and the same amount who don’t want to be bothered with picking up the shrimp and removing the tail after the dish has been served. Personally, I make it both ways, it just depends on my mood. There are pluses to each method. If you remove the tails ( before cooking the shrimp) you can just chow down on the creamy pasta and get those tasty lemony garlic shrimp in your mouth a bit faster. If you leave the tails intact, it does make for a nice presentation. Which camp do you fall in? Seafood can sometimes be tricky to reheat. If you do find yourself with leftover Shrimp Scampi, I’d suggest putting it in a shallow ovenproof dish and covering it with aluminum foil. Cook for about 20 minutes at 350F. If desired sprinkle with grated Parmesan cheese right before serving. Bring a large pot of water to boil ( salt water if desired). Add pasta and cook according to directions (you’ll want the pasta to be “al dente”) . When pasta is cooked, reserve ¼-1/2 cup of pasta cooking water, drain and rinse pasta, set aside. Rinse shrimp and pat dry with paper towels. Season with salt and pepper to taste. Add olive oil to a large skillet (or the same pot used for pasta) over medium-high heat. Have garlic, wine, red pepper flakes measured and ready to add when needed (the shrimp cooks fast). Add shrimp and cook for 1 minute. Turn shrimp over and add garlic, wine and red pepper flakes. Continue cooking until shrimp are just opaque (slightly white) and turning pink and wine has reduced by about half ( approx. 2 minutes). Remove pan from heat and add the butter. Stir until butter is fully melted. Add pasta and squeeze juice of half a lemon over pasta (about 1 Tbsp). Toss pasta, adding reserved pasta water (a little at a time- you may not need all of the reserved water) so sauce evenly coats pasta. Garnish with grated Parmesan cheese and extra parsley if desired. * For lower carb options serve over zoodles, Kohlrabi linguine or cauliflower rice.